Photograph of the carved pillars in the Bhulavani at Satrunjaya, from the Archaeological Survey of India Collections taken by Henry Cousens in the 1880s-1890s. Satrunjaya is an ancient Jain place of pilgrimage where it is believed that Adinatha, the first Jain Tirthankara visited several times and his disciple Pundarika obtained enlightenment. On the two summits of the hill, which rise 600 m above the plain around the town of Palitana, there are many hundreds of multi-spired temples where every day pilgrims come to pay reverence to the different Jain saints. The Bhulavani or Labyrinth built in the 18th cenury is a large building divided into a series of small crypt-like chambers with an elaborate domed ceiling . The central shrine has an unusual opening in the floor through which one can see an image in a sunken storey. 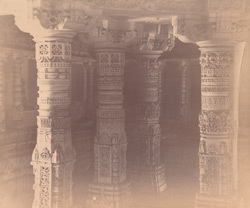 The pillars have tall square bases and polygonal shafts with ornamental motifs.